In order to keep pace with the never ending demands of customers, we are involved into offering wide range of Milk Pasteurization Tank. 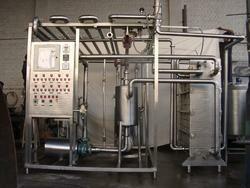 Backed by well-informed professionals, we are offering an extensive series of Pasteuriser Plant. Additionally, our products are made as per advanced technique. Our organization is involved in manufacturing a wide range of Milk Pasteurization plant, which is used for different applications in dairy, food, beverage, brewery, edible oil, chemicals & pharmaceuticals. This is used to heat the product to specific temperature & then cool it to required temperature, when it is flowing in the pipe lines. It also includes the optional equipment’s for fat separation, homogenization, de aerator & standardization. - Pasteurisation time 30 - 90 sec.